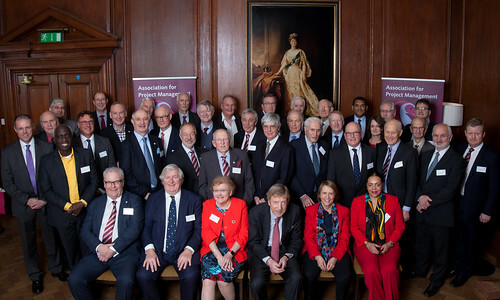 The Honorary Fellows’ Lunch has once again brought together a group of the most esteemed project professionals as part of an annual tradition celebrating newly-appointed APM Honorary Fellows and the achievements of the profession. This year the event was indeed a day of both celebration and remembrance as attendees looked back on a journey which has lead to APM receiving its Royal Charter from Her Majesty the Queen. As well as looking back at the huge strides the profession has made over the years and remembering members and associates who are no longer with us, guest speaker Nick Borwell, Director of the Project Delivery Profession, Infrastructure and Projects Authority, looked towards the future reflecting on the challenges faced by major projects in Government, including new initiatives and how developing capability in people and methodologies would help drive the profession forward. The lunch took place at the Marriot County Hall Hotel, London on 8 February 2017. A full list of APM’s Honorary Fellows can be found here. David Birch – An expert in delivering high-profile UK and international project portfolios, including the London 2012 games. Louise Hardy - A Stemnet ambassador and one of the top 50 most influential women in engineering who specialises in delivering projects, including the Jubilee Line extension. Matthew Riley – An advisor to the Mayor of London’s infrastructure delivery board and a non-executive director to the board of the Association for the Consultancy and Engineering. Sylvana Storey – A published author, lecturer and business psychologist. Julie Wood - Director at Arup as the global leader of programme and project management with responsibility for a £16bn portfolio of projects. Bill Johnson - Former branch chair and APM council member who has spent his career developing project professionals.